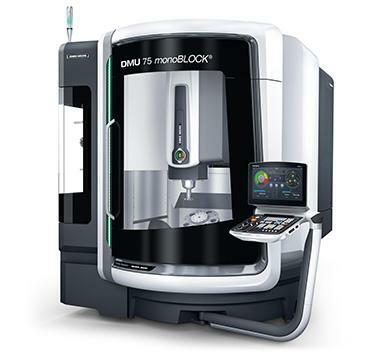 The DMU 75 monoBLOCK offers from the outset a first-class equipment consisting of a folding NC circular table, speedmasterTER spindle of 20,000 rpm and a store for 60 tools. In less than 8 m² pieces of up to ø 850 mm x 500 mm in thickness and 600 kg can be machined. The work area can be freely loaded from the top and make access for table positioning of large volume parts easier. The integrated Heidenhain TNC 640 3D controls complete this unique global 5-axis package.